PBteen, a member of the Williams-Sonoma, Inc. (NYSE:WSM) portfolio of brands, has launched its exclusive collaboration with Kelly Slater, the 11-time world surfing champion. This new capsule collection, available at PBteen.com today, is the most eco-conscious assortment that Pottery Barn has ever made and marks Slaters introduction into the world of home furnishings. To celebrate Earth Day and this collection debut, PBteen invites teens to share photos of how they are making an environmental difference via Instagram with #HowIHelpTheEarth and @pbteen for a chance to win a $250 PBteen gift card. Kelly Slaters genuine passion for sustainability is at the heart of the Kelly Slater for PBteen collection. Combining PBteens fresh and authentic designs with Slaters commitment to global conservation, the assortment was inspired by a desire to reduce environmental impact. The collection boasts more than 40 pieces, including furniture built with FSC-certified wood, rugs made with recycled fibers, and bedding composed of certified 100% organic cotton. Environmentally responsible materials have also been incorporated into the packaging and store marketing for the collection. The assortment ranges from $29.00 to $1,999.00 and also includes categories such as wall d’ecor, lighting, decorative pillows and jewelry storage. “I’m really excited to be working with PBteen, said Kelly Slater. Im honored that PBteen has seen me as someone who can help a broader audience understand the need to use recycled, repurposed and organic materials. Global conservation is a focal point of the capsule collection and it falls right in line with the change and direction Im working towards, on a professional and personal basis. In collaborating with PBteen, we are creating a subtle and natural feel with this collection – something that has an authentic appeal for teens and their parents alike. We are thrilled to collaborate with Kelly Slater on this collection as there isnt a better ambassador for the surf lifestyle, said Sandra Stangl, President, Pottery Barn Brands. As a mother of teen-aged kids who are avid surfers, I have seen the rise of the surf movement up close and feel this is not just a trend, but a way of life. While collaborating with Kelly, he challenged our team to bring sustainability to every part of the Kelly Slater for PBteen collection. We are proud to say this is the most environmentally responsible collection we have brought to market to date. We believe its empowering to show tweens and teens, regardless of whether they surf, that they can make a difference for the worlds resources by being mindful of their personal choices. The Kelly Slater for PBteen collection features an array of eco-conscious d’ecor and home furnishings that bring authentic surfer style indoors. Collection highlights include the Latitude Lounger crafted in the U.S.A. with recycled cotton upholstery and foam thats been reclaimed from the automotive industry, the Dover Storage Bed made with FSC-certified wood, and the Shoreline Wind Chime crafted with found driftwood and recycled copper. 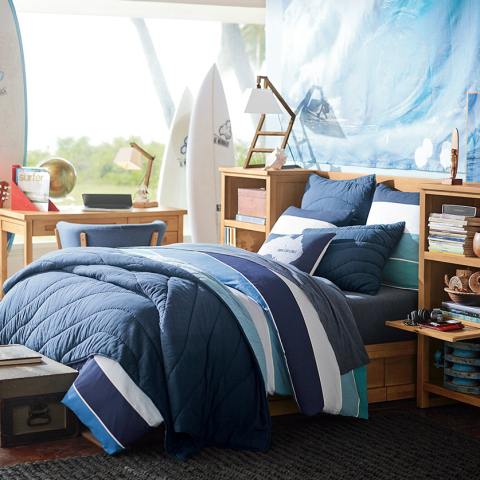 Surf inspiration can be seen throughout the collection, with details such as a lifeguard tower-inspired table lamp and a point break wave-inspired quilt & sham. Lastly, the collection includes the 100% organic Surf Spot Pillow Covers that highlight Slaters favorite surfing locations. The product collection, as well as Kelly Slater behind-the-scenes footage and interviews, are available today at PBteen.com/KellySlater. The collection has launched with exclusive PBteen videos featuring as its soundtrack, Ben Howards song Old Pine, and can be viewed at PBteen.com/Kelly-Slater-Videos. The collection will be featured in all PBteen stores starting on April 3rd. The PBteen catalog will feature the collection starting on April 7th. Earth Day Contest: Share photos of how you are making a difference in the world for a chance to win a $250 PBteen gift card. Entrants must upload a photo to Instagram with the tag #HowIHelpTheEarth and @pbteen for a chance to win. Follow PBteen on Instagram @pbteen and #kellyslater4pbteen or follow Facebook Pottery Barn Teen PBteen to get exclusive access to our Kelly Slater campaign throughout the month of the April. PBteen, a member of the Williams-Sonoma, Inc. portfolio of brands, launched in 2003 and is the first home retailer to focus exclusively on the teenage market. Designed to fully furnish bedrooms, study and lounge spaces for tweens and teens, PBteen provides fresh, fashionable options to appeal to varying teenage tastes. Categories include: bedding, window treatments, rugs, lighting, gear, decorative accessories, storage and organization solutions, and furniture including beanbag chairs. PBdorm, launched in 2010, is an exclusive collection that offers dorm furniture and essentials. This collection includes XL twin sheets, lighting, seating, storage bins and organization solutions, and other accessories designed to help teens turn their dorm room into their ultimate home away from home. PBteen products are available through direct mail catalogs, e-commerce site PBteen.com and at eighteen U.S. retail stores. PBteen currently offers international shipping to customers worldwide. PBteen has an active following on Facebook, Twitter, YouTube, Pinterest, Instagram, PBteen and its new blog theStyleHouse. Additionally, PBdorm has a dedicated Facebook, Pinterest and Instagram presence, as well as a blog Style Major. PBteen is headquartered in San Francisco, California. Williams-Sonoma, Inc. is a specialty retailer of high-quality products for the home. These products, representing eight distinct merchandise strategies Williams-Sonoma, Pottery Barn, Pottery Barn Kids, West Elm, PBteen, Williams-Sonoma Home, Rejuvenation, and Mark and Graham are marketed through e-commerce websites, direct mail catalogs and 601 stores. Williams-Sonoma, Inc. currently operates in the United States, Canada, Australia and the United Kingdom, offers international shipping to customers worldwide, and has unaffiliated franchisees that operate stores in the Middle East and the Philippines. Kelly Slater is the best competitive surfer of all time. He has garnered an unprecedented 11 WSL World Championships, 54 World Championship Tour victories, and 2 X-Games Gold Medals, totaling over 20 years of dominance. Aside from his competitive accomplishments, Kellys free-surfing, out-of-the-box maneuvers, and spontaneous approach to surfing continue to change how people surf and view the sport. Kelly has not only changed the sport forever, but has also redefined the archetype of a surfer through his professionalism, style, and character. He is a true champion considered by many to be the most influential surfer in history.